Last Sunday I had the pleasure of being invited up to the Copper Cow, situated in Sowerby Bridge, Halifax. I had come across Copper Cow via my Instagram a couple of months back but was yet to find the time to visit. I was so glad I finally got the chance to go for Sunday lunch. The restaurant has a lovely warm atmosphere, with a modern, rustic feel. Copper Cow is your typical Yorkshire style pub that serves locally sourced food that can be washed down with some amazing cocktails. Everyone says that when you walk into a restaurant the way you are greeted is the one thing that sticks with you, whether it is good or bad. We walked in through the front entrance into the bar area, where we were greeted by the most fabulous barman. He welcomed us, asked us how we were, sorted out our drinks and our table. We took a seat in the bar area whilst we waited for our table to be ready and he continued to make us feel comfortable and welcome. A truly fabulous Yorkshire welcome. As it was a Sunday, we knew we had to go for the Sunday roast, and the platter was calling our names. Why have one meat when you can have them all? We did have a little look on the starters, which if I had one little complaint was that there wasn’t enough choice. I prefer a starter and main rather than a starter and dessert. On Sundays they only offer three starter options, and none really stood out, which was a shame. However, I don’t really know where to start with the Sunday roast platter. We ordered one for 2 people and it could have fed 4. For only £10 per person, it is exceptional value for money and the quality of every single ingredient was outstanding. The platter was served with 2 slices of beef each, cooked either pink or well done. Two of the biggest chicken wings/legs I have ever seen, and a slice of pork each, with crispy crackling. It also came with roast potatoes, seasonal veg, Yorkshire puddings (of course) and gravy. We also got a side of mash, which was some of the best mash we had had. The selection of vegetables were carrots cooked in star anise, cauliflower, green beans and red cabbage cooked in blackcurrants. Everything down to the vegetables was cooked perfectly and pack full of flavour. Easily one of the best Sunday roasts I have had, apart from my mums haha! 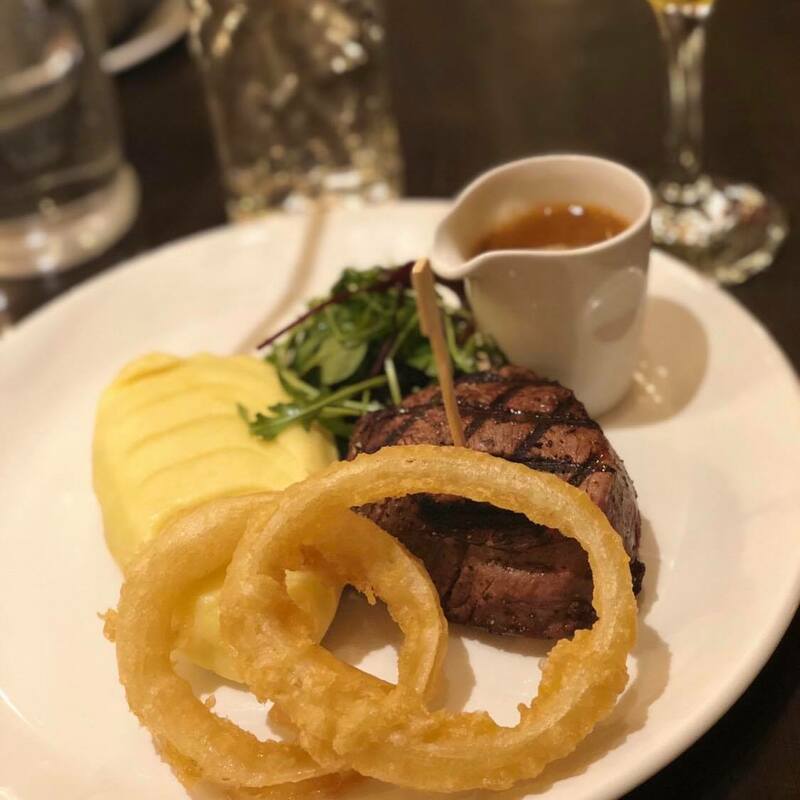 I have to say if you are a beef lover, like we are, you will appreciate the quality of the beef at Copper Cow – it melted in the mouth and was cooked just how I like it. We managed most of the platter but still had enough leftovers to take home, which was great because who doesn’t love a beef sandwich the next day. The waitress/waiters were also so lovely; they checked we were ok, made sure we had plenty of drinks and then even managed to persuade us to getting a dessert. I have no idea how I managed it, but I ate every mouthful. For dessert I went for the bread and butter pudding, not my usual choice. But this was a bread and butter pudding with a twist. White chocolate, brioche, strawberry baileys served with the best white chocolate custard. I am a huge white chocolate fan, and this was the perfect end to a Sunday lunch. My sister opted for the sticky toffee sundae, she was a bit reluctant at first as she is a huge sticky toffee pudding fan and was expecting it to be deconstructed when in sundae form. However, to her delight it was a full sticky toffee sponge at the bottom, drowning in sauce, with ice cream on top and then cream. The perfect sticky toffee sundae in our eyes. Overall, the experience at Copper Cow, was lovely. Amazing food, drinks and service. I would highly recommend for Sunday lunch and even for weekday lunches and evenings meals. Their Valentines meal also sounds lovely, so why not treat your loved ones to a trip next week. Make sure you head over to their website (http://thecoppercowhalifax.co.uk/ ) to get booked in now. I promise you, you won’t be disappointed. We enjoyed our visit that much we have already booked to go again in a weeks’ time! I am dying to try the Copper Cow Steak Sandwich or Buffalo Chicken Burger. Both meals we saw on the pass on Sunday and they looked incredible. Another dish on their evening menu, that is calling my name, is the braised short rib with crab mac ‘n’ cheese, crispy mac ‘n’ cheese balls, truffle oil and pea shoots – how amazing does that sound! I need to book again just so I can try it asap. P.S When you go don’t drive because their pornstar martinis are exceptional along with their gin menu. I hope you enjoyed another review and let me know your opinions on Copper Cow, or any other places you think I should visit, in the comments below!